Commercial rubber backed nylon barrier entrance mats. 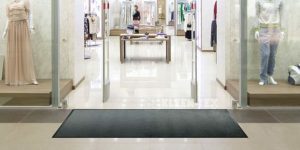 High quality throw down barrier entrance mats are designed to control dust as well as preventing dirt and moisture from being tracked into the building. With a choice of over 40 standard colours to choose from as well as the option of matching any pantone colour at a small additional charge. High quality logo barrier entrance matting will display your corporate brand, logo and message in a professional way. The barrier mats are lazer printed providing exceptional accuracy of your design. Also, an effective solution for advertising and promotion campaigns.